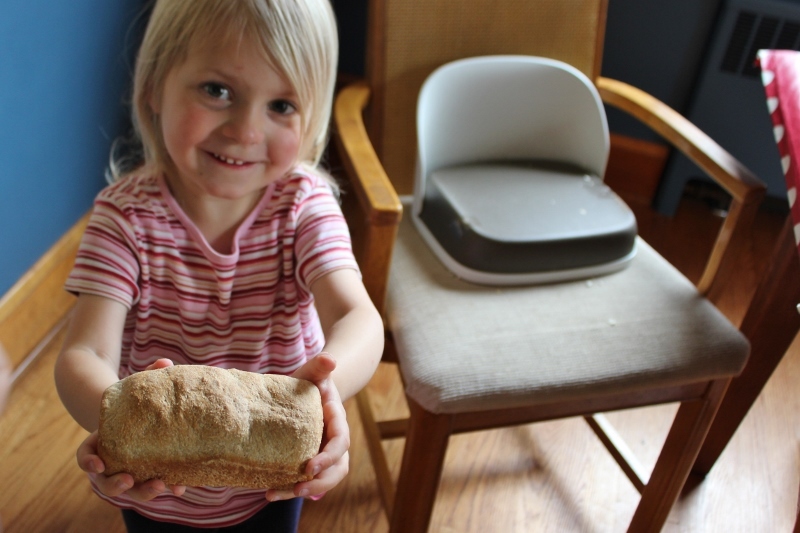 Ellie has been quite happily helping me make our sandwich bread (rather, form the loaves) for almost two years now. We have our routine – I roll it out the first time and fold it up, she rolls it flat the second time, I finish the rolling, we both roll it into a log, pinch the seam, tuck in the ends, she lifts into the pan, and then punches it down with her fists. A month ago, she dissolved into tears and then a big tantrum because she wanted to make bread all by herself (i.e Mama not touching the dough AT ALL EVER). So, two weeks ago, when I next made bread, I allocated a lump of bread just for her and she did the whole process as I described above, but by herself. 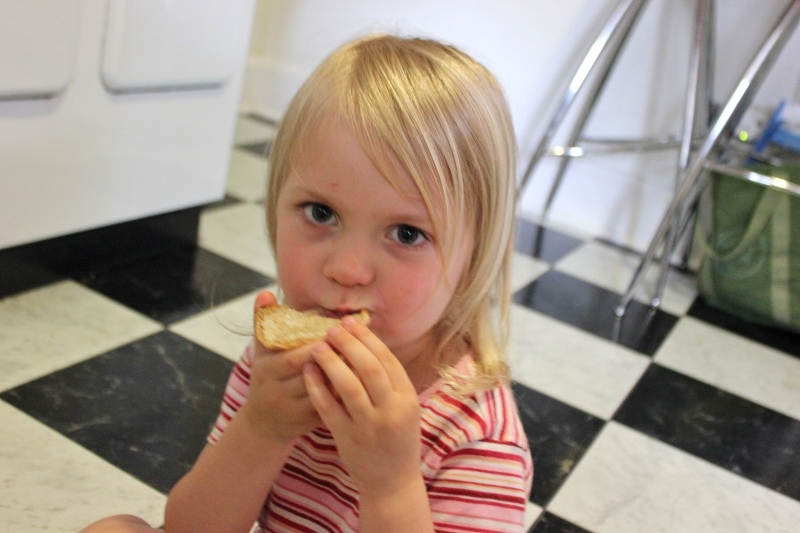 At her request, she ate crusts (i.e. end pieces), as we call them in my family. 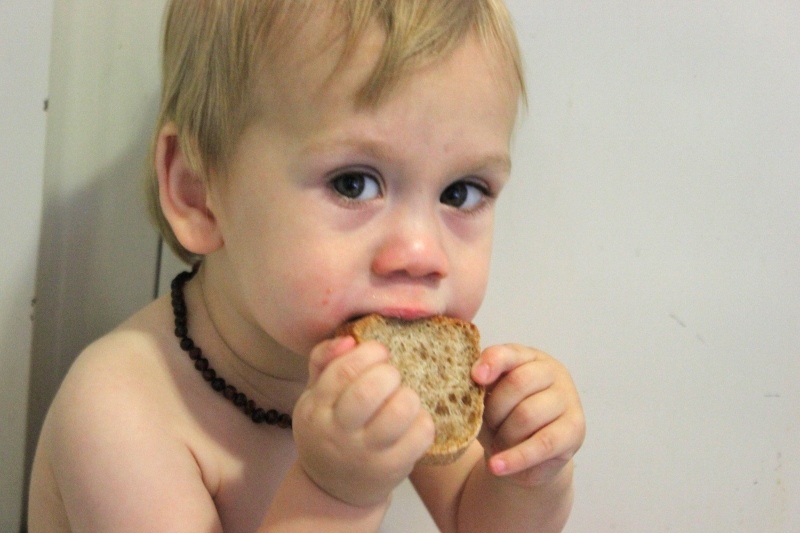 Nik doesn’t think they should be called “crusts” because every slice of bread has a crust on it but I disagree. Clearly, we fight about words a lot. We’re still fighting about ouchie vs. boo-boo! Enjoying the fruits of her labor! After some convincing, she shared with her brother too! We’ve since made bread one more time and again, she made her own loaf. I think this will be what we do from now on. It’s a win-win for me – she’s happy because she’s making bread, “all by myself, Mama!! !” and I’m happy because while she’s slowly making her way through the bread process, I’m cruising along, forming bread way faster than when she’s “helping”. Now, of course, Mark wants to help too so here we go again – teaching another child to make bread! This entry was posted in cooking, Ellie, Mark. Bookmark the permalink. Wow! Did this ever take me back a few years to when you were at my side doing the same thing! Love it! So cute! And the comment from your mama makes it even cuter!